Korea is first port of call (well, it would be, wouldn't it?) 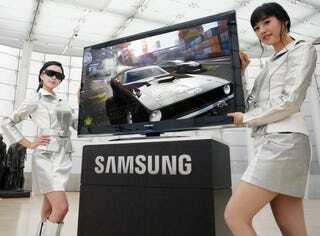 for these 3D-ready plasmas from Samsung. Available in two sizes: 42; and 50 inches, the PAVV Cannes 450 has a 30,000:1 ratio and 3D content support, and will work with high-performance PC-supporting 3D software and 3D glasses. And there's even a super-expensive, HD version, the Cannes 550. More info, plus another shot, below. The Cannes 450 has Cell Light Control, 2008 Daylight technology and a DNIe+ chipset, as well as enhanced low-sound performance and three entertainment modes: sports; movie; and games.